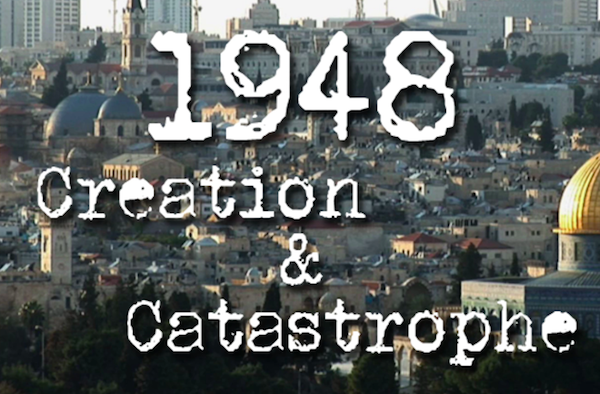 The screening of the controversial “1948: Creation and Catastrophe” as part of West Hollywood’s Human Rights Speakers Series is back on the calendar. The city has confirmed that the film will be shown at 6 p.m. on April 16 at the City Council Chambers, 625 N. San Vicente Blvd. Last year the city canceleda proposed Dec. 12 screening of the documentary at the request of City Council members Lindsey Horvath and Lauren Meister. They were responding to requests from Rabbi Denise Eger of Congregation Kol Ami and other members of the city’s Jewish community. “I am shocked that the City of West Hollywood is allowing this piece of anti-Israel propaganda to be shown on city property,” Rabbi Eger said in an email to City Council members. “ … This in our city with a sizeable Jewish population The film ‘1948’ is unbalanced and nothing but propaganda..
“The person who is a producer for this so called documentary is a well-documented anti-Israel anti-Semitic professor who regularly attacks Israel and the Jewish people ,” Eger wrote “… I am urging you the members of the City Council to cancel this event.” The producer of the film to whom Rabbi Eger referred is Ahlam Muhtaseb. She and its co-producer, Andy Trimlett, were to have participated in a panel discussion after the Dec. 12 screening. The documentary has been criticized by some who see it as being anti-Israel and have called out Muhstaseb for comments she has made about Israel. Muhtaseb is a professor of media studies at California State University, San Bernardino, who has done field work in Palestinian refugee camps in the Lebanon, Syria, and Palestine. The cancellation last year put Horvath and Meister in the middle of a controversy that other Democratic politicians have struggled with. Israel’s creation of Jewish settlements in Palestine has drawn criticism from younger and more progressive members of the Democratic Party and from college students who have organized rallies calling for boycotts of companies that do business with Israel. While struggling with the conservative political views of Israeli Prime Minister Benjamin Netanyahu, more moderate Democrats have continued to support Israel and its occupation of Palestine. That occupation also is supported by the American Israel Public Affairs Committee (AIPAC), a politically powerful organization whose annual events are attended by many politicians, including West Hollywood City Councilmember John Duran. Other American supporters of the Palestine settlements and Netanyahu’s actions are Christian conservatives and Donald Trump. Rabbi Eger has called out Muhtaseb for her support for the “Boycott, Divestment, Sanctions” movement, which calls for people and governments to boycott Israel and divest from Israeli companies. The West Hollywood City Council in 2016 voted to back Assemblymember Richard Bloom’s AB 2844, the Boycott, Divestment and Sanctions of Israel Act, meant to bar the state from doing business with companies that engaged in such boycotts and sanctions of Israel. A watered-down version, which covered all nations supported by the United States, was enacted into law despite the opposition of the American Civil Liberties Union and other progressive organizations. — Robin Kelley, UCLA, an American historian and academic who is the Gary B. Nash Professor of American History at UCLA. From 2006 to 2011, he was Professor of American Studies and Ethnicity at the University of Southern California (USC), and from 2003 to 2006 he was the William B. Ransford Professor of Cultural and Historical Studies at Columbia University. From 1994 to 2003, he was a professor of history and Africana Studies at New York University (NYU) as well the chair of NYU’s history department from 2002 to 2003. Kelley has also served as a Hess Scholar-in-Residence at Brooklyn College. In the summer of 2000, he was honored as a Montgomery Fellow at Dartmouth College, where he taught and mentored a class of sophomores, as well as wrote the majority of the book Freedom Dreams. During the academic year 2009–10, Kelley held the Harmsworth Chair of American History at Oxford University, the first African-American historian to do so since the chair was established in 1922. He was awarded the Guggenheim Fellowship in 2014. Tolan is a co-founder of Homelands Productions, which for 25 years has produced international documentary and features for public radio. He reports on and comments frequently about Palestine and Israel. His latest book is “Children of the Stone: The Power of Music in a Hard Land” (2015, Bloomsbury), about one Palestinian’s dream to build a music school in the midst of Israel’s military occupation. He is also the author of the international best-seller, “The Lemon Tree,” a history of the Israeli-Palestinian conflict. — James Gelvin, UCLA, an American scholar of Middle Eastern history. He has been a faculty member in the department of history at the University of California, Los Angeles, since 1995 and has written extensively on the history of the modern Middle East, with particular emphasis on nationalism and the social and cultural history of the modern Middle East. Gelvin earned his B.A. from Columbia University in 1983, M.A. from the School of International and Public Affairs of Columbia University in 1985, and Ph.D. from Harvard University in 1992. Before joining the faculty at UCLA, he taught at the Massachusetts Institute of Technology (MIT), Boston College, and Harvard University. He has been a fellow at the Woodrow Wilson International Center for Scholars (1999–2000) and the recipient of a U.C. President’s Fellowship in the Humanities (1999–2000). In 2002-3, he was Sheikh Zayed bin Sultan Al Nahyan Visiting Professor of History at the American University in Beirut. The panel will be moderated by Estee Chandler, KPFK host of “Middle East in Focus.” She is the Jewish American daughter of an Israeli father (and an American mother.) She grew up in Southern California where her work in the film industry, on both sides of the camera, spans more than 30 years. In 2007 she joined the volunteer ranks of the Obama for America Campaign and spent a year as a deputy field organizer helping to train hundreds of volunteers in the greater Los Angeles area. She also served as a delegate representing California’s 28th Congressional district at the 2008 Democratic Convention in Denver, Col. In 2010 she launched a Los Angeles chapter of Jewish Voice for Peace (JVP), a national organization promoting solutions based on universal human rights for both Palestinians and Israelis equally and that fights efforts to silence debate about US-Israeli/Palestinian policy. It works with other Jewish, Arab-American, faith-based, peace and social justice organizations. Glad to hear the film is on as the previous banning of the film assaulted the 1st Amendment of the U.S. Consititution. Now free speech has been restored with showing of the film. I’ve seen the film online for about $5, and it’s brilliant. The producers did ten years of research including in many archives. Yes, the co-producers should have been on the panel along with the film’s screening. I am extremely happy about this. Not because of the controversy it caused the first time around. I simply want to learn and hear all thoughts. Censorship is not good for any of us. It deprives people from learning and forming their own opinions/beliefs. I may despise the message this film puts forward, but I don’t want to be banned from seeing it. It would be a rare and unique opportunity for the producers of this film to be welcomed with an open mind in the West Hollywood Community. Occupation is occupation but here we will actually have an opportunity to discuss events. To my understanding, God has anointed no winners in the journey of life. The best we can do is to treat each other with respect. and broaden our understanding. Let’s just see the film and judge it on its historical merits or lack thereof. It was wrong to cancel the initial screening. There is nothing disgraceful or disrespectful in allowing citizens to view even controversial material, encouraging civil conversation. As it is, the initial canceling has served as a kind of paternalistic “trigger warning” protective of the “feelings” of those of us who haven’t yet seen it. agreed. the cancelation has caused the barbra streisand effect. What a disgrace to the city and disrespect to its Jewish population. Good for West Hollywood. People are finally coming to their senses!! I am disappointed that the public will not hear from the co-producers of the film. I would think that they should have been included in the panel to defend the film and allow the public to have insight into their creative process. Rabbi Eger should have also been included as she clearly has strong opinions on the film and she is a beloved figure in our community. While “balance” is a challenge when addressing this subject, we are better for having heard the discussion and being allowed to make up our own opinions and I commend the City for having the courage to screen this film and fostering mature debate.